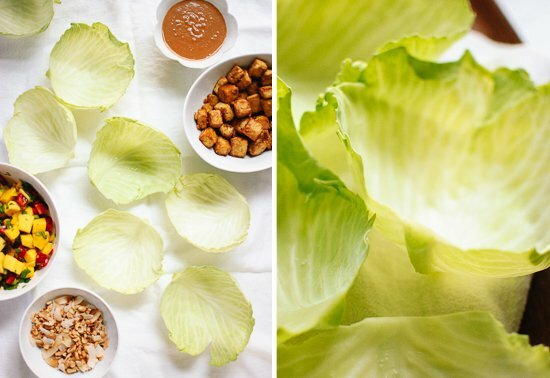 You should make these salad wraps. Over-stuff them all you want. 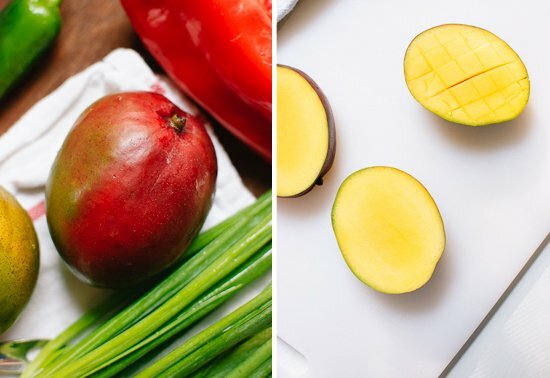 I had a general “tropical salsa meal” concept on my recipe list already, but these wraps didn’t come to be until I tried Ali’s Thai-style nachos at her super cool loft. 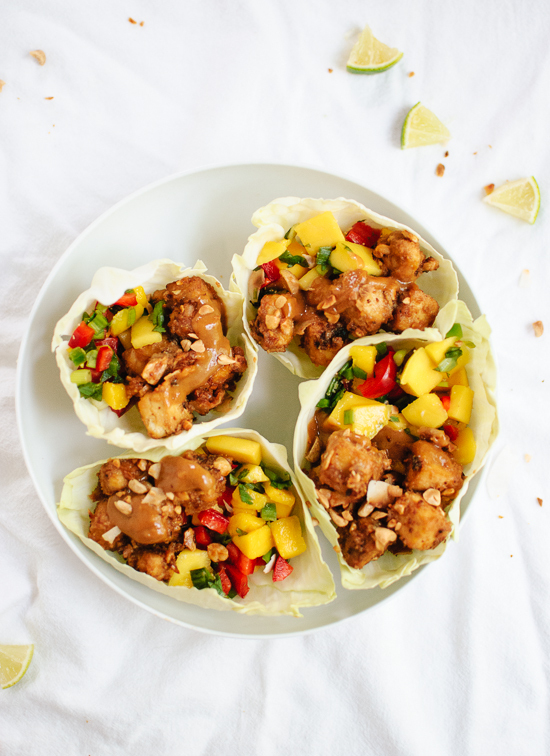 She topped her nachos with mango salsa and a drizzle of peanut sauce. Delicious! 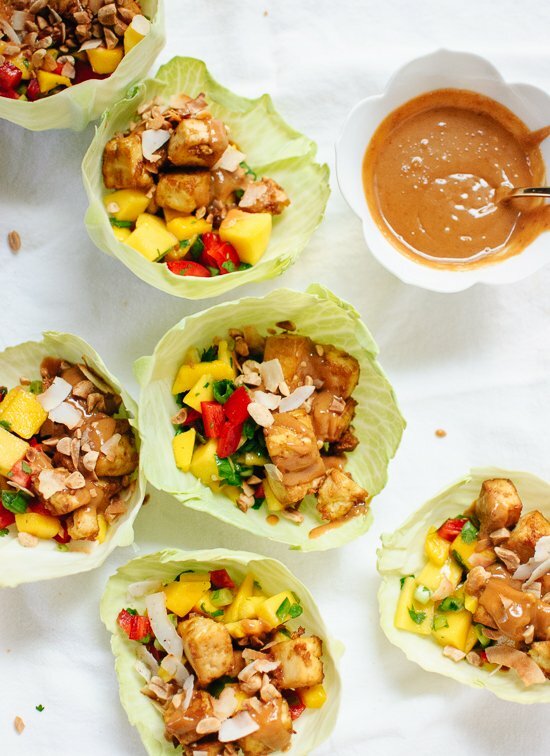 Mango salsa, crispy baked tofu and an irresistible peanut sauce on cabbage leaves. These salad wraps are light and delicious! Recipe yields 6 to 8 salad wraps. To prepare the tofu: Preheat oven to 400 degrees Fahrenheit and line a rimmed baking sheet with parchment paper. Drain the tofu and use your palms to gently squeeze out some of the water. Slice the tofu into thirds so you have three ½-inch slabs. 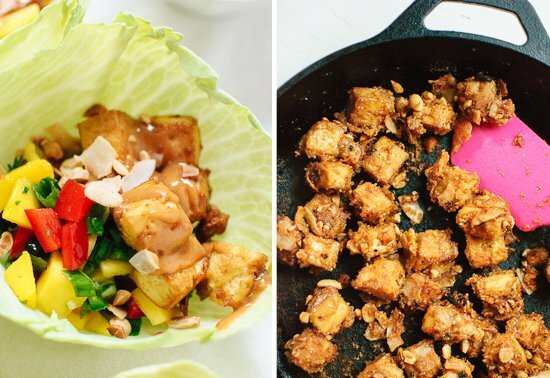 Transfer the tofu to a plate lined with a lint-free tea towel or paper towels. Fold the towel over one tofu slab, then place the other slab on top, then repeat with the last slab. Top with more towel and place something heavy on top (like a cast iron skillet) to help press the water out of the tofu. While the tofu drains, make the peanut sauce: Simply whisk together all of the sauce ingredients until well blended. If the flavor seems too bold or the sauce is too thick, thin it with a tablespoon or two of water. Set aside. 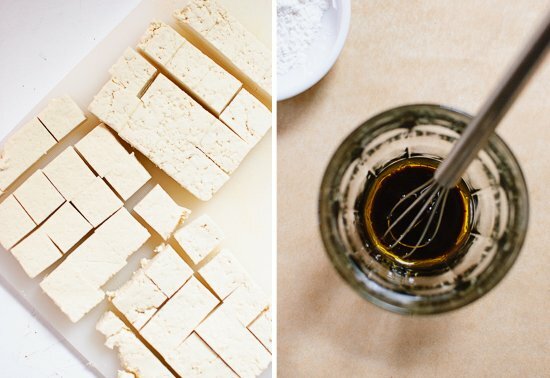 To bake the tofu: Transfer the drained tofu to a cutting board. Slice each slab into four columns and four rows. Whisk together 1 tablespoon olive oil and tamari, then drizzle it over the tofu and toss to coat. Sprinkle 1 teaspoon arrowroot starch over the tofu, then toss the tofu until the starch is evenly incorporated. Repeat with 1 more teaspoon arrowroot starch. 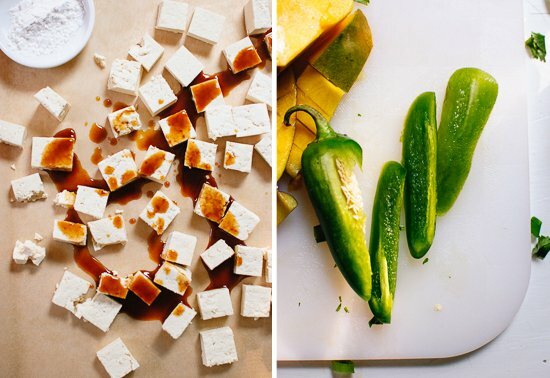 Arrange the tofu in an even layer on the baking sheet. 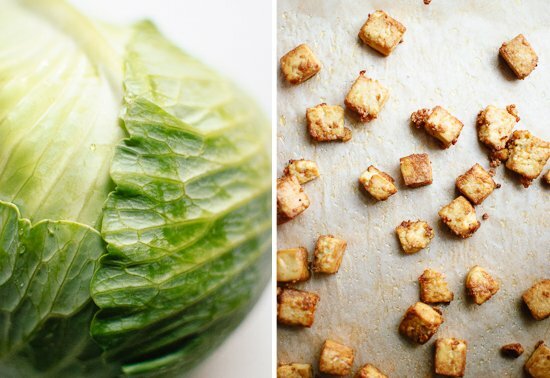 Bake for 30 to 35 minutes, tossing halfway, until the tofu is crisp and deeply golden. 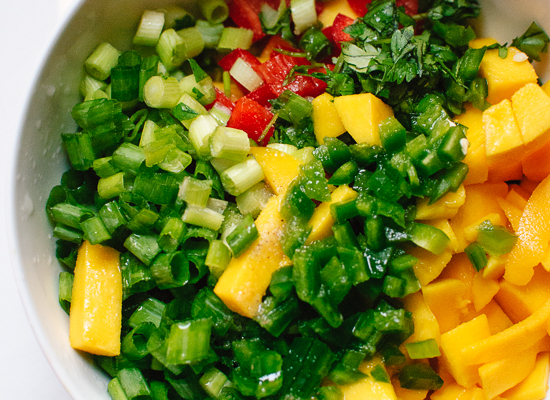 To make the mango salsa: Combine ingredients in a small serving bowl and toss. Taste, and add additional salt and/or a little splash of white wine vinegar if necessary. Set aside. To prepare the cabbage/lettuce: Slice off the thick stem and bottom ¼th of the head of cabbage/lettuce. Gently pull off one leaf at a time. Repeat until you have 6 to 8 cabbage leaves. If you want to go the extra mile with the tofu: Once the tofu has finished baking, toast the coconut flakes and chopped peanuts in a medium skillet over medium heat, stirring frequently, until the coconut is golden on the edges. Add the tofu to the pan. Pour in ⅔rds of the peanut sauce and toss to coat. Cook, stirring frequently, until the tofu has absorbed the sauce and has turned golden on the edges. Transfer to a plate to cool. To assemble the cabbage wraps: Divide the salsa amongst the salad wraps. Top with tofu and additional peanut sauce. Serve!